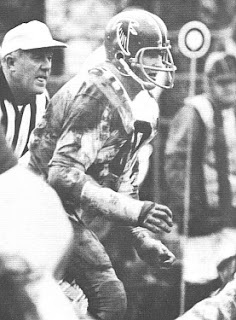 Nobis, a two-time All-American and winner of the 1965 Outland Trophy, was the first overall selection by the expansion Falcons in the ’66 NFL draft and received a large bonus to keep him away from the Houston Oilers of the rival AFL, who also took him in the first round. He became the centerpiece of the new club’s defense, moving directly into the starting lineup at middle linebacker. Falcons went 3-11 to finish seventh in the NFL Eastern Conference. Nobis followed up his noteworthy rookie season by achieving first-team All-Pro honors in 1967 from the Associated Press and New York Daily News as well as a second Pro Bowl selection. He was again a Pro Bowl selection in ’68, along with being a consensus second-team All-Pro, but knee injuries cost him most of the 1969 and ’71 seasons. When healthy, he was still a premier linebacker and was selected to two more Pro Bowls, following 1970 and ’72. Nobis played through 1976, a total of 11 years and 133 games, and ended up with 12 interceptions – two of which he returned for touchdowns – 13 fumble recoveries, and five Pro Bowl selections while playing for a team that never reached the postseason. The Falcons retired his #60.